The independent counsel looking into the Druking scandal searched the home and office of South Gyeongsang Province Gov. Kim Kyoung-soo on Thursday, as it gears up to summon him for questioning. Kim has been implicated in the case since the beginning, but his status in the investigation was changed to that of a suspect just this week. According to reports, Kim could be questioned as early as the weekend. In the early hours of Thursday, investigators were dispatched to Kim’s home and office in Changwon, South Gyeongsang Province, to search the premises. He was not present during the search, having taken an unplanned one-day leave. 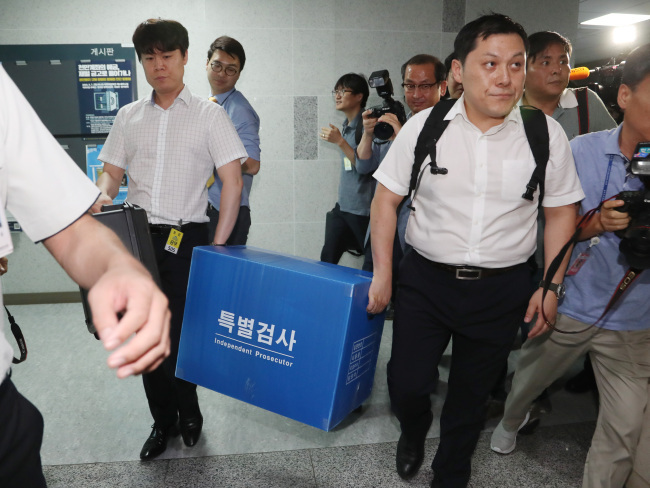 Investigators were also sent to the National Assembly to retrieve the computer used by Kim while he served as a lawmaker of the ruling Democratic Party of Korea. The data stored on the equipment, however, is said to have been permanently deleted. The investigators now believe that Kim was an accomplice of Kim Dong-won, known as “Druking,” in the online opinion-rigging scheme. Kim Dong-won, who is alleged to have used illegal software to conduct the campaign to influence public opinion, claims the governor was aware of his actions. He is being investigated under detention. It has also been alleged that Kim Dong-won planned to use former South Chungcheong Province Gov. An Hee-jung to push his ideas for reforming conglomerates. Gov. Kim introduced An to Kim, and the former South Chungcheong Province governor was invited to a lecture organized by Kim Dong-won. Kim Dong-won is also said to have written that he and his associates needed to persuade An to run for the Democratic Party leadership in a document recording his meeting with Gov. Kim in November 2017. Following the suicide of the Justice Party’s Rep. Roh Hoe-chan, the special counsel concluded that Kim Dong-won and his associates had attempted to gain political influence through blackmail and bribery. Roh took his life last month, admitting to receiving money from Kim Dong-won while denying he had promised any favors in return.